Don't ask me why that matters. It just does. A lot. Everything on Earth, everything in our solar system, everything in our galaxy, and everything in the universe is made up of matter. Matter is the name that scientists have given to everything that you can touch, or see, or feel, or smell. Go take a look! Matter is everything around you. Matter is anything made of Atoms and molecules. Matter is anything that has a mass. Matter is also related to light and electromagnetic radiation. Even though matter can be found all over the universe, you usually find it in just a few forms. As of 1995, scientists have identified five states of matter. They may discover one more by the time you get old. You should know about solids, liquids, gases, plasmas, and a new one called Bose-Einstein condensates. The first four have been around a long time. The scientists who worked with the Bose-Einstein condensate received a Nobel Prize for their work in 1995. But what makes a state of matter? It's about the physical state of molecules and atoms. Sun has more matter than all planets Elements and compounds can move from one physical state to another and not change. Oxygen (O2) as a gas still has the same properties as liquid oxygen. The liquid state is colder and denser but the molecules are still the same. Water is another example. The compound water is made up of two hydrogen (H) atoms and one oxygen (O) atom. 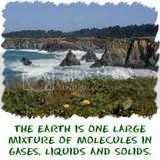 It has the same molecular structure whether it is a gas, liquid, or solid. Although its physical state may change, its chemical state remains the same. So you ask, "What is a chemical state?" If the formula of water were to change, that would be a chemical change. If you added another oxygen atom, you would make hydrogen peroxide (H2O2). Its molecules would not be water anymore. Changing states of matter is about changing densities, pressures, temperatures, and other physical properties. The basic chemical structure does not change. can move from phase to phase, but still be the same substance. You can see water vapor over a boiling pot of water. That vapor (or gas) can condense and become a drop of water. If you put that drop in the freezer, it would become a solid. No matter what phase it was in, it was always water. It always had the same chemical properties. On the other hand, a chemical change would change the way the water acted, eventually making it not water, but something completely new. So what is a solid? Solids are usually hard because their molecules have been packed together. The closer your molecules are, the harder you are. Solids also can hold their own shape. A rock will always look like a rock unless something happens to it. The same goes for a diamond. Even when you grind up a solid into a powder, you will see little tiny pieces of that solid under a microscope. Liquids will move and fill up any container. Solids like their shape. In the same way that a solid holds its shape, the atoms inside of a solid are not allowed to move around too much. This is one of the physical characteristics of solids. Atoms and molecules in liquids and gases are bouncing and floating around, free to move where they want. The molecules in a solid are stuck. The atoms still spin and the electrons fly around, but the entire atom will not change position. Solids can be made up of many things. They can have pure elements or a variety of compounds inside. When you get more than one type of compound in a solid it is called a mixture. Most rocks are mixtures of many different compounds. Concrete is a good example of a manmade mixture. Crystals hold geometric shapes On the other end of the spectrum from a mixture is something called a crystal. When a solid is made up of a pure substance and forms slowly, it can become a crystal. Not all pure substances form crystals because it is a delicate process. The atoms are arranged in a regular repeating pattern called a cystal lattice. A crystal lattice is a very exact organization of atoms. A good example is carbon. A diamond is a perfect crystal lattice while the graphite arrangement is more random.